Do you need physiotherapy? You can now refer yourself to the local NHS Physiotherapy service directly. Please click on the link below. Diabetes - half hour appointments on Monday afternoons with the practice nurse. Child health surveillance - Mother & Baby Clinic on Tuesdays between 14:00 - 16:00. Family planning - we offer a comprehensive service. We are not, currently, able to offer coil fitting or contraceptive implants. 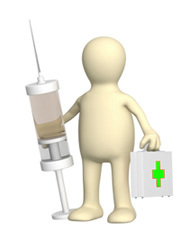 Vaccinations and immunisations - including flu and travel. The practice is a designated Yellow Fever Centre. Maternity services - all of our GP's provide full antenatal and postnatal care in partnership with the hospital. Diphtheria, tetanus, pertussis (whooping cough), polio, hepatitis B and Haemophilus influenzae type b (Hib, a bacterial infection that can cause severe pneumonia or meningitis in young children) given as a 6-in-1 single jab known as DTaP/IPV/Hib/HepB. Diphtheria, tetanus, pertussis and polio (DtaP/IPV), given as a 4-in-1 pre-school booster. Cervical cancer (HPV) vaccine, which protects against cervical cancer caused by human papillomavirus types 16 and 18 (and gential warts caused by types 6 and 11). Two doses 6-24months apart. If you require any vaccinations relating to foreign travel you need to make an appointment with the practice nurse to discuss your travel arrangements and to determine what vaccinations are required. Your Travel Clinic appointment should be at least 6 weeks before you travel. Please print out and complete our Travel Risk Assessment Form We shall need to see the completed questionnaire at least two working days before your Travel Clinic appointment. Remember to include details of any previous vaccinations but please also check fitfortravel.nhs.uk/for more information. There is further information about countries and vaccinations required on the links below. It is important to make this initial appointment as early as possible - at least 6 weeks before you travel - as a further appointment may be required to complete vaccination course. Some vaccines may have to be ordered if they are not a stock vaccine. You need to complete your vaccinations at least 2 weeks before you travel to give them time to become effective. Not all travel vaccinations are included in the services provided by the NHS, therefore some will incur a charge. If you are travelling to Europe a very useful booklet has been published with advice and guidance to help you get the most out of your holiday. To visit please click:- http://ec.europa.eu/publications/booklets/eu_glance/86/en.pdf (this is a large document and may take a minute or two to view). We are pleased to inform you that this practice is also a designated Yellow Fever Centre. You do not require a doctor's sickness certificate for any illness lasting seven days or less. Your employer may however require you to complete a self-certification form (SC2) which is available from your employer or at our reception or on the HMRC website. The fees charged are based on the British Medical Association (BMA) suggested scales and our reception staff will be happy to advise you about them along with appointment availability. Please allow 21 days for completion of private medical reports. Private referral letters will be ready for collection in 3 working days. North Road Surgery does not offer an occupational health service. Pre-employment investigations, tests and vaccinations are the responsibility of the employer. The General Practitioners and Practice Nurses are, therefore, unable to comply with requests for employment-related investigations and vaccinations.